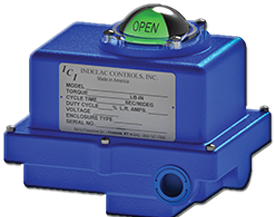 Water & Wastewater | Indelac Controls, Inc. Valve actuators serve a variety of functions in water and sewage treatment plants. They control the flow of billions of gallons of water/wastewater daily and must withstand high water pressures, high flow velocities, extreme temperatures, and environmental exposure. While being subjected to these harsh conditions, valve actuators need to provide consistent accuracy, precision, and control—as the slightest failure can have critical safety and financial consequences. Of special note for water and wastewater treatment operations, our heavy duty K Series quarter-turn electric actuators are especially useful for the high-pressure, high-flow applications. The K Series features corrosion resistant polyester coatings, a NEMA 4 enclosure, increased power capacity, and a range of other protective features that make them one of the most durable heavy duty electric actuators on the market. All of our actuators are designed, manufactured, and tested with maximum durability, service life, and performance in mind. We use hardened steel gears, permanent lubrication, and heavy duty sand-casted aluminum enclosures to protect against harmful environmental factors and extreme temperatures. All product lines include actuators featuring NEMA 4, NEMA 4X, NEMA 7, and NEMA 9 compliant enclosures for safe operation in hazardous environments. We also offer also special protective coatings – epoxy coatings, electroless nickel plating, chromium conversion coatings, and anodized coatings – for actuators that must operate in abrasive or corrosive conditions. For over three decades, ICI has built a reputation as a leading provider of the electric rotary actuators used in a wide range of industries. Our actuators and related products are well known for their ease of installation, low power consumption, durability, cost-effectiveness, and minimal maintenance requirements. To learn more about how ICI can assist you in selecting the right electric actuator for your application, please contact our technical team or request a quote.